Biblical stories are metaphorical. They may have been accepted as factual hundreds of years ago, but today they cannot be taken literally. Some students in religious schools even recoil from the "fairy tales" of religion, believing them to be mockeries of their intelligence. David Tacey argues that biblical language should not be read as history, and it was never intended as literal description. At best it is metaphorical, but he does not deny these stories have spiritual meaning. 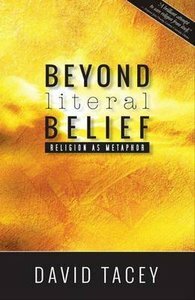 Religion as Metaphor argues that despite what tradition tells us, if we "believe" religious language, we miss religion's spiritual meaning. Tacey argues that religious language was not designed to be historical reporting, but rather to resonate in the soul and direct us toward transcendent realities. Its impact was intended to be closer to poetry than theology. The book uses specific examples to make its case: Jesus, the Virgin Birth, the Kingdom of God, the Apocalypse, Satan, and the Resurrection. Tacey shows that, with the aid of contemporary thought and depth psychology, we can re-read religious stories as metaphors of the spirit and the interior life. Moving beyond literal thinking will save religion from itself. About "Beyond Literal Belief: Religion as Metaphor"
Dr David Tacey (PhD.,University of Adelaide) is Associate Professor and Reader in Arts at La Trobe University, Melbourne, Australia, where he teaches literature, spirituality and Jungian psychology. He is the author of five books on spirituality and culture, including Edge of the Sacred, The Spirituality Revolution and ReEnchantment: The New Australian Spirituality.